Contains fabulously soothing, balancing and de-stressing organic essential oils - lavender, rose geranium and basil. Already carefully blended for use on the body. 100% organic ingredients. 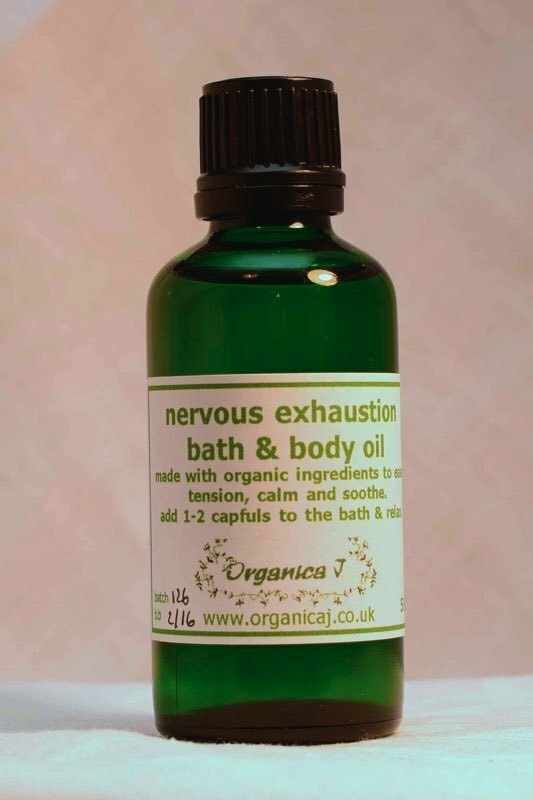 Why not use alongside the Nervous Exhaustion Bath & Body Oil to complement is Geranium & Rose or Lavender and Lavender Flower Organic Soap. So gentle, cleansing and moisturising on skin, and the soaps can be used on face and body. Contains: *helianthus annus (sunflower), *sweet almond (prunus dulcis), *triticum vulgare (wheatgerm), *lavandula angustifolia (lavender), *pelargonium graveolens (geranium), *ocimum basilicum (basil), limonene, linalool, citronellol, geraniol, eugenol (from essential oils).